A Ford Econoline van, over thirty years old and totally plain from the looks of it, but when you step inside...! To be more exact, Carlos lives in the back of a 1981 Ford Econoline E350 – in Chile. Before you start feeling sorry for Carlos, or say something like, “Well, that’s probably not bad in Chile”, think again. This is no “van down by the river” we’re talking about here. 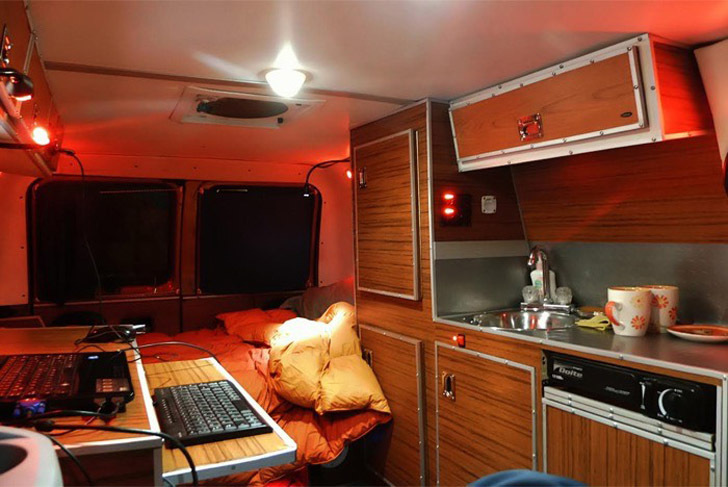 This is a DIY masterpiece of an RV featuring a state-of-the-art home office that allows Carlos to work while he travels the South American country. I decide to make a change. 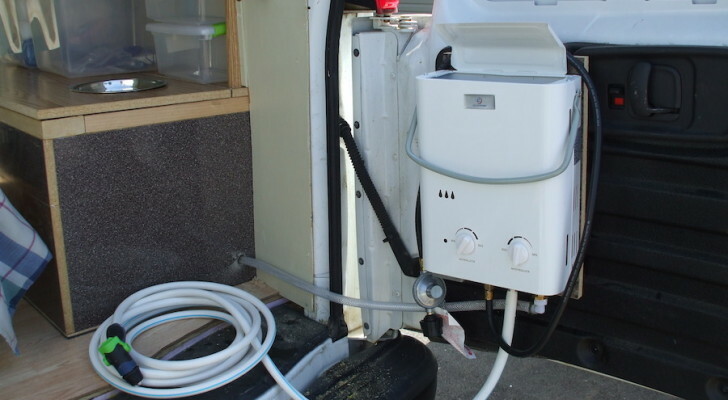 Living and working in a Campervan by choice. It´s time to build our dream machines. 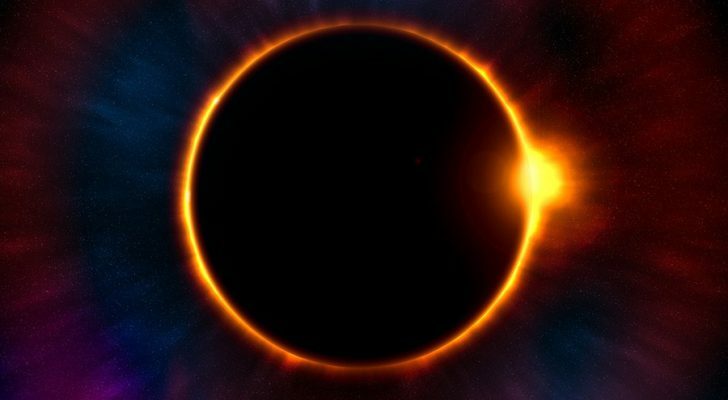 Time to go around and see the world with our own eyes. 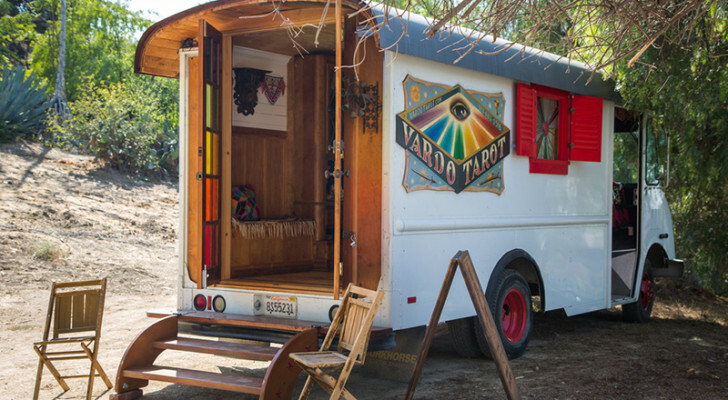 The unassuming exterior of Carlos’ “office” on wheels. 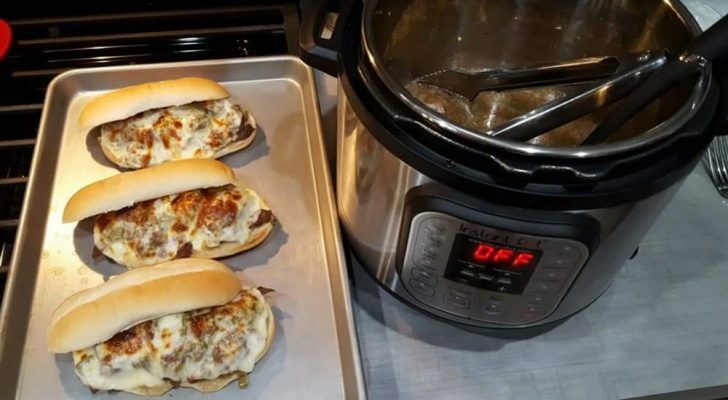 His goal was to start, “living with less to enjoy more,” and we can see how he put that goal to practice. Carlos’ conversion was a labor of love. He was, after all, creating his own home. As one professional carpenter to a DIY guy, my hat is off to you sir! 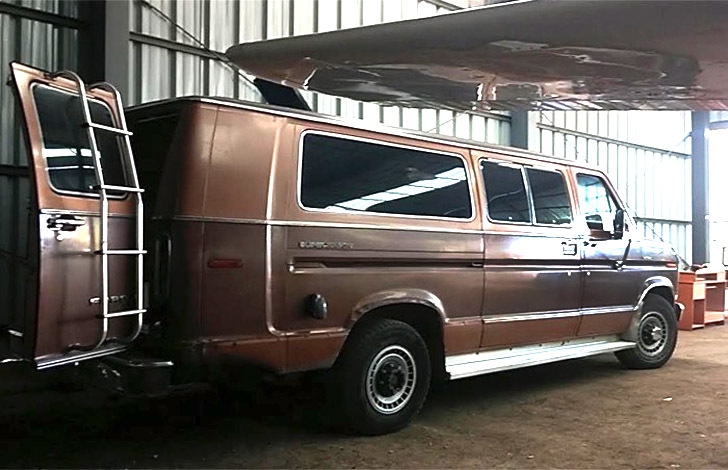 For more than 4 years I been working in the conversion of my old Ford Econoline E-350, 1981. 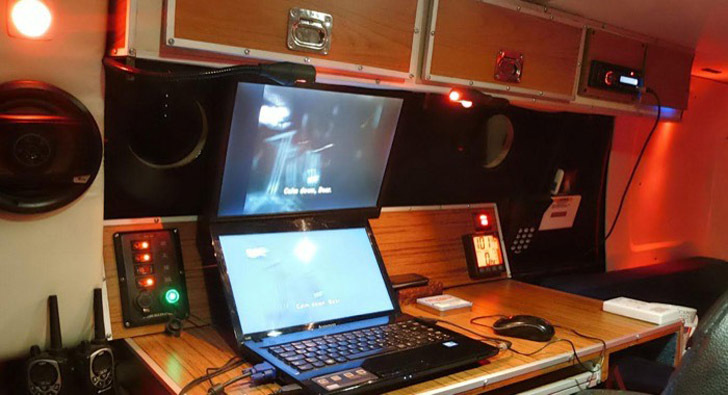 The main idea for this project was to create a hybrid between a Mobile Office and a campervan to live full time on it. Of course, because security is important in my country Chile, it also had to be a Stealth Van. From front to rear, with the bed and dining table both put away. The cabinetry fits well in the space allotted, with wood laminates contrasting the blue fabric walls. 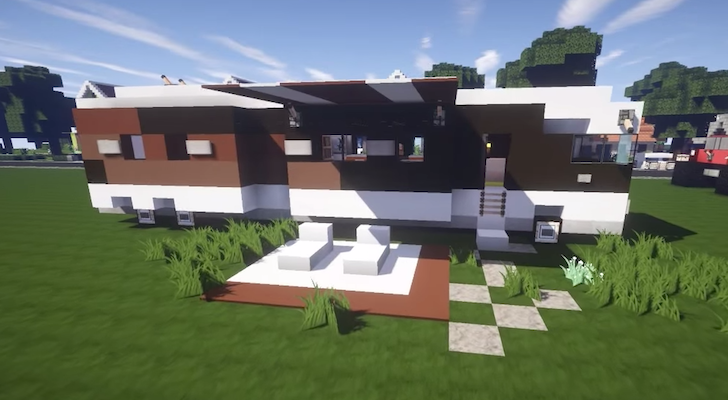 He was aiming for a blend between camper van and a rolling office. By shrinking down his life, he made it more manageable to have the things he wanted. 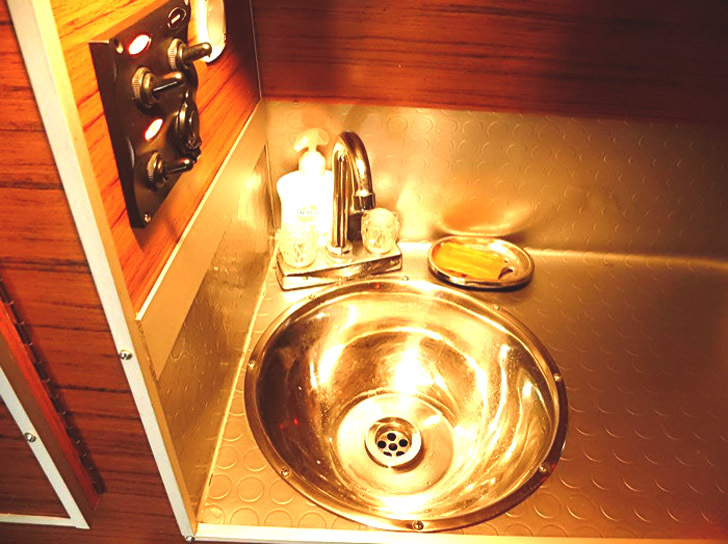 He also built in a kitchen, with sink. He’s got a self sustaining lifestyle – albeit with an occasional bathroom break. Since I finish this van now is time to start travelling and working inside of my van, living with less to enjoy more. My goal is to create enough passive income through online business while I am working and travelling in my dream machine. A view from the cab into the office section of the van. From the outside, if you heard Carlos say the van is his home, you might be tempted to feel concern. 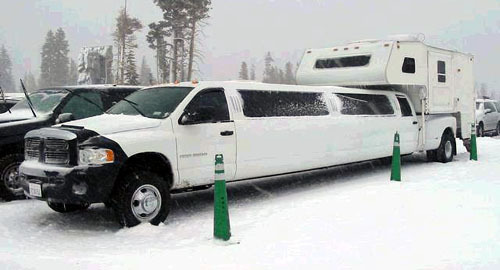 But the warm and inviting interior doesn’t really match the humble vehicle that hauls it. With lots of task lighting, ample storage and a well finished design, it’s a home. I want to encourage other people to live with less, build they own places to suit they unique needs and enjoy a life of freedom while making what you really love. Today with the Internet, we have all the tools to do that and live with more freedom creating a kind of lifestyle that will give us happiness and health. Plenty of room for a laptop and auxiliary monitor on the desk top. The empty work space as seen from the rear of the van. 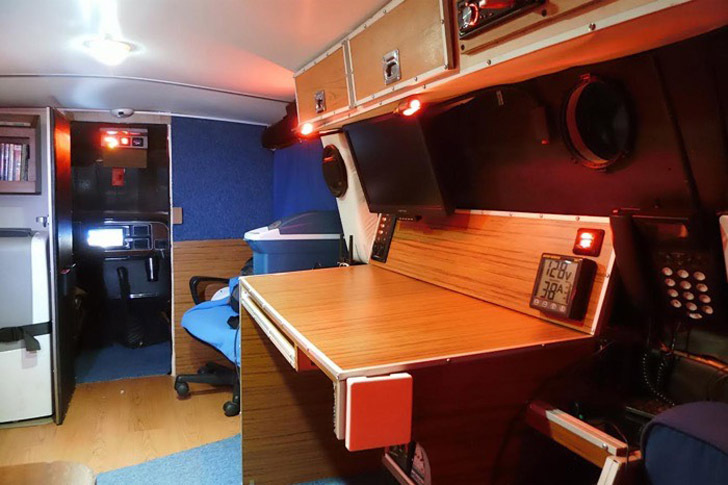 The cab of the van is separated by a partial bulkhead, with the office section starting right behind it and taking up the center of the van. There’s a desk on one side and the kitchenette on the other. 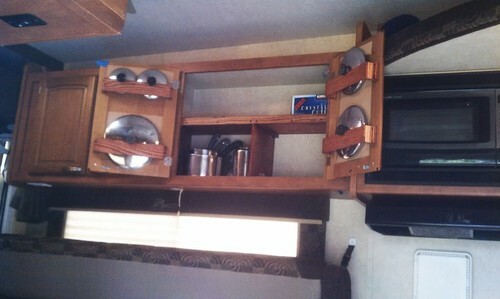 He has borrowed a page from the Airstream book with “airliner style” cabinets along the roof line with locking doors. Carlos installed this pressure driven sink set in a stainless steel work surface. A wider view of the kitchen while in use. All of the laminated wood cabinets feature metal corner trim for durability and a modern look that’s carried throughout the van. 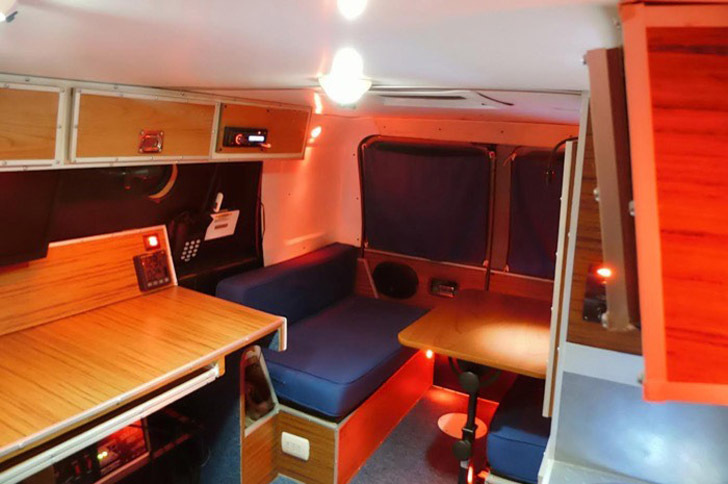 While most conversions feature a dinette at “amidships” accessible from the double side door, Carlos has chosen to position his bed in front of the rear doors. Since it converts into a dinette, the table goes there to. 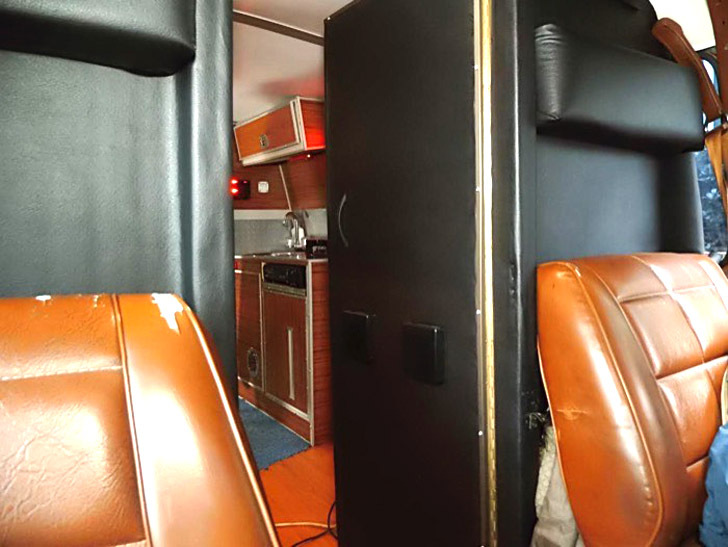 The bed runs in front of the rear doors, when the dinette is converted for sleep. 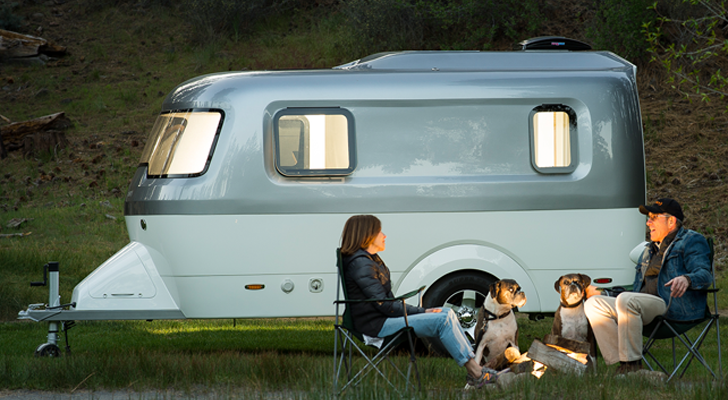 The floorplan is well laid out and spacious, seemingly larger than the van would allow. The galley style design leaves enough open space for a full sized desk chair, while the cabinetry and other features are scaled properly to fit in. 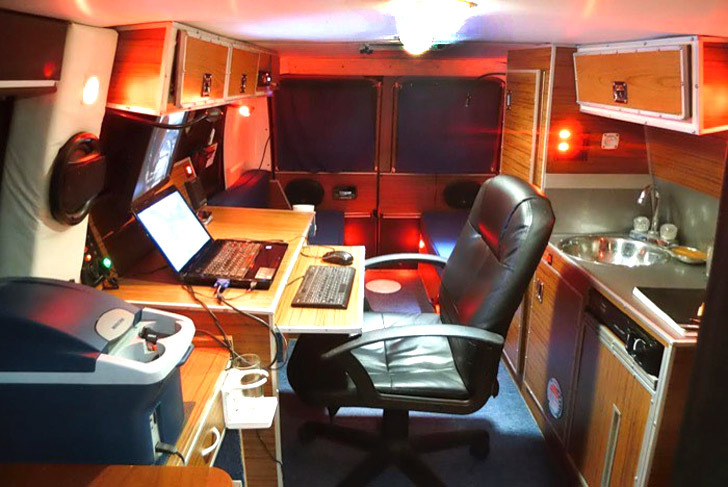 Whatever Carlos’ business, he has created a comfy mobile office with enough space to meet with a couple of clients at a time, while providing the elbow room he needs to sleep and eat comfortably. 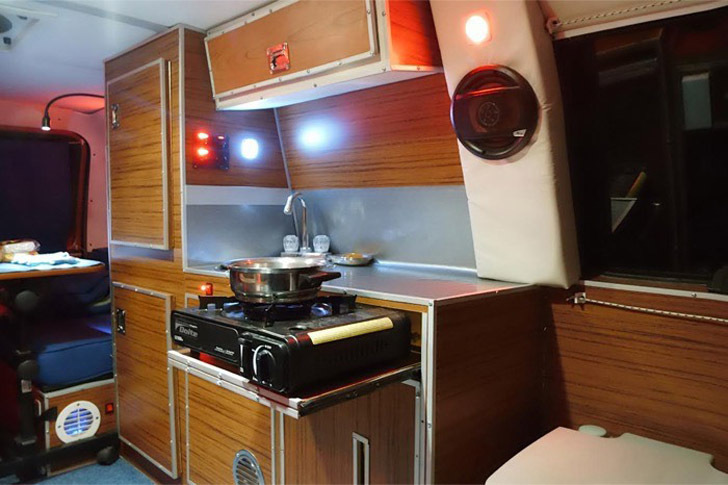 And the dinette is fairly spacious, even with the table in place. Carlos’ YouTube channel, OfficeCamper, has a wealth of information for would-be van conversion enthusiasts. I think this video, Van Dwelling: First Lessons Learned, would be a great place to start! Have Carlos show you around the inside of his van.